What’s Wrong With The NBA? I’ll tell you what’s wrong. The Philadelphia 76ers are 0-10, and since I’m from Philly, that’s a BIG problem! The Los Angeles Lakers are 1-9, and therefore all of LA Land is in meltdown. The Oklahoma City Thunder are 3-8 (sans Kevin Durant, 2013 NBA MVP), and The Los Angeles Clippers and Cleveland Cavaliers are 5-4. On the other hand, the Memphis Grizzlies are 10-1; the Toronto Raptors are 8-2; and the Washington Wizards are 7-2. Go figure. Age-old and perennial powerhouses are at the bottom of the heap, and wishful-thinking, wanna-be teams like the Wizards and Raptors (they were a good team a LONG time ago) are first place in their Division? So what’s up with that? 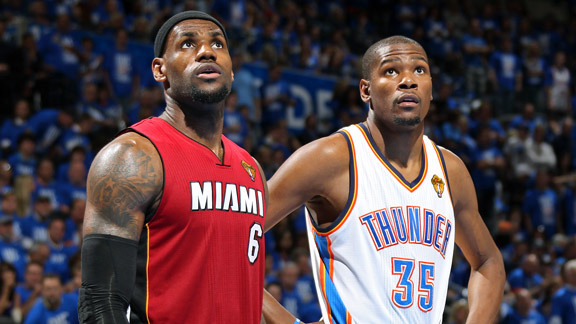 LeBron James and Kevin Durant are what’s right with the NBA as they are the faces of the NBA franchise. One has won championships recently and the other is the reigning League MVP, but they can’t hold down the fort all by themselves. Durant is hurt and LeBron is back in Cleveland with a new team and new teammates who are trying to find themselves and figure it out. What’s wrong with the NBA? Who can watch these games? It’s too early in the season to really pay attention, as most games end too late in the evening to stay up and watch. There’s too much competition from the NFL and college football, and there’s too little interest from middle-aged men like me to warrant any viable discussion about a bunch of overpaid, over privileged, over-hyped “kids” playing what amounts to a slowdown, one-on-one style of game with no “teamwork” in sight. What’s wrong with the NBA? The great NBA legends of the game are long gone, such as Wilt Chamberlain, Bill Russell, Willis Reed, Earl “The Pearl” Monroe, Jerry West, Elgin Baylor, John Havlicek, and of course, the greats from my generation such as Dr. J, Moses Malone, David Robinson, Magic Johnson, Larry Bird, Isaiah Thomas, Hakeem Olajuwon, Bill Walton, George Gervin, and of course, Michael Jordan. Without them, the game is just not the same. So what’s right with the NBA? We still love the game and we will still watch, but not until after Christmas. I mean, the regular season for the NBA is about as exciting and enthralling as watching paint dry. The new kids, such as Kevin Durant and Derrick Rose and of course LeBron James have charisma and chutzpah, but it’s just not the same as it was before. Many of the newbies in the League lack character and don’t have a reputation for being solid and stable people. And many have a problem with Christianity as well, for just the same reasons. Many Christians lack muster and metal, moral fiber and spiritual muscle. The lack of integrity and veracity, legitimacy and authenticity turns people off. So, the challenge for Christians is to be true to the fundamentals and foundations, the nitty-gritty and nuts and bolts of our faith. I may be old-fashioned an old fuddy dud, but I believe that character still counts. I really don’t care how good you can play ball if you stink at playing the game of life. PS: I thought this article (see below) spoke to why we as Christians are sometimes given the cold shoulder by unbelievers, because we should be willing and able to share our faith (the verb) with those who question and query our Faith (the noun). Anybody?